Coughing is a common symptom of mold exposure, along with sneezing, a runny nose or a stuffy nose, a sore throat, shortness of breath, wheezing and headaches. Not everyone exposed to mold develops a cough, but many people do, especially with prolonged exposure. Infants, small children, elderly people and those with respiratory disorders or disorders of the immune system are at increased risk for mold-related illness, but anyone can be affected. In fact, even family pets can get sick if they are exposed to mold in the home. Why Does Exposure to Mold Cause Coughing? Even a small patch of mold produces thousands and thousands of mold spores, which are very light and easily become airborne. Then they can easily be inhaled. Inhaling mold spores can irritate the sensitive lining of the throat, causing a cough. Exposure to mold frequently causes other illnesses, like bronchitis and pneumonia, which also cause coughing. How Do You Know if Coughing is Caused by Mold Exposure? 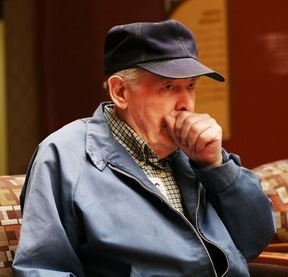 Of course, a cough can be caused by many things other than exposure to mold, including a cold or other respiratory virus, influenza (the flu), seasonal allergies, bronchitis and pneumonia. Some of those illnesses can actually be caused by exposure to mold, such as bronchitis and pneumonia, though of course mold is not the only cause of those conditions. If you think you’ve been exposed to mold, then it is possible mold is causing you to cough. The only way to know for sure, though, is to see your doctor for a diagnosis. Make sure to let your doctor know if you’ve been exposed to household mold or think mold may be causing your cough. Your doctor may order tests, such as blood tests, chest x-rays or laboratory tests of any sputum, to help make an accurate diagnosis. Your doctor will recommend treatment based on the cause of your cough. Treatment may include antibiotics for an infection, antihistamines to dry up excessive mucous and a cough suppressant if coughing is keeping you awake at night, although in some instances doctors feel it’s preferable for you to continue to cough up mucous or other secretions that are in your lungs or airways. You can use cough drops to help soothe your throat and relieve your cough. Tylenol or ibuprofen is often recommended to reduce a fever as well as relieve aches and pains, though you should check with your doctor before using any over-the-counter medications if you’re also taking prescription medications for your illness. In order for treatment to be effective, you’ll also need to prevent continued exposure to mold. If you continue to be exposed to mold, you will probably continue to suffer symptoms and your condition may even worsen. It’s important to thoroughly remove all mold from your home and to take steps to prevent mold from returning in order to prevent future mold-related illness. You’ll need to figure out what caused mold to start growing in your home to begin with and correct the problem in order to prevent mold from returning. That means fixing leaky pipes, repairing leaky roofs, etc. We recommend scheduling a free in-home consultation with a mold remediation professional that will inspect your home and advise you about the mold removal process as well as ways to prevent mold from returning. If you’re experiencing a cough or other health problems related to exposure to mold, it’s probably best for you to have a professional handle the mold removal for you so that you aren’t exposed to more mold and don’t make your condition worse. Even if you plan to handle the mold removal yourself, though, you can benefit from some free expert advice. Follow this link to find experienced mold removal professionals offering free in-home consultations near you.